Background The association between diabetes mellitus (DM) treatment and dementia is not well understood. Objective To investigate the association between treatment of diabetes, hypoglycemia, and dementia risk. Research design and methods We performed a systematic review and meta-analysis of pharmacological treatment of diabetes and incident or progressive cognitive impairment. We searched Ovid MEDLINE, Embase, Cochrane Central Registry of Controlled Trials, and PsychINFO from inception to 18 October 2017. We included cross-sectional, case–control, cohort, and randomized controlled studies. The study was registered with PROSPERO (ID CRD42017077953). Results We included 37 studies into our systematic review and 13 into our meta-analysis. Ten studies investigated any antidiabetic treatment compared with no treatment or as add-on therapy to prior care. Treatment with an antidiabetic agent, in general, was not associated with incident dementia (risk ratio (RR) 1.01; 95% CI 0.93 to 1.10). However, we found differential effects across drug classes, with a signal of harm associated with insulin therapy (RR 1.21; 95% CI 1.06 to 1.39), but potentially protective effects with thiazolidinedione exposure (RR 0.71; 95% CI 0.55 to 0.93). Severe hypoglycemic episodes were associated with a nearly twofold increased likelihood of incident dementia (RR 1.77; 95% CI 1.35 to 2.33). Most studies did not account for DM duration or severity. Conclusions and limitations The association between treatment for diabetes and dementia is differential according to drug class, which is potentially mediated by hypoglycemic risk. Not accounting for DM duration and/or severity is a major limitation in the available evidence base. Diabetes is a risk factor for developing dementia, yet the impact of diabetes management on cognitive decline remains uncertain. We found that antidiabetic treatment effects on cognitive outcomes may differ by drug class. We also found that severe hypoglycemia is associated with nearly a twofold increased risk of incident dementia. Past studies have poorly accounted for duration and severity of diabetes, which introduces confounding in the association between specific antidiabetic treatments and incident cognitive impairment. This is an area that may be addressed by future studies. Studies suggest that cognitive decline in older individuals with DM is associated with poor glycemic control and more frequent episodes of severe hypoglycemia.7 However, the impact of diabetes management on the rate of cognitive decline in individuals with established cognitive deficits including dementia remains uncertain.7 The association between treatment of DM and cognitive outcomes has been variably reported across studies with significant differences in the type of diabetic treatment and its intensity, size of the studies, follow-up duration, and handling of potential confounding. Addressing this, we conducted a systematic review and meta-analysis to investigate the association between pharmacological treatment of DM and cognitive outcomes in adults. We performed literature searches of Ovid MEDLINE, Embase, Cochrane Central Registry of Controlled Trials, and PsychINFO electronic databases from inception to 18 October 2017. Two authors (JMM and BSM) reviewed reference lists of included articles for additional relevant studies and contacted study authors of included studies if further information was required. The main search concepts were type 2 DM, dementia or mild cognitive impairment, and pharmacological agents used to treat DM (online supplementary appendix). We developed a comprehensive list of pharmacological agents in use for the treatment of DM based on numerous international clinical practice guidelines including the Canadian Diabetes Association, the American Diabetes Association, Diabetes Australia, and the National Institute for Health and Care Excellence. We sought the expertise of a content expert in the management of DM to assist in creating the list of pharmacological treatments. The search strategy was developed in consultation with two medical librarians at the University of Calgary. Within each search cluster, the keywords Medical Subject Headings, EMTREE, PsychINFO, and Cochrane terms were combined using “or”. Each cluster was then combined using “and” (online supplementary appendix). Two independent reviewers (BSM and JMM) screened titles and abstracts in duplicate. The primary inclusion criterion was pharmacological treatment of DM in adults. In the initial screening phase, titles and abstracts were included if the study enrolled participants with DM and any form of cognitive outcome. In the full-text screening phase, articles were reviewed in duplicate (BSM and JMM) and included if the study investigated the pharmacological treatment of DM in adults with both DM and cognitive outcome measures. Studies were excluded if they did not enroll patients with both DM and dementia, investigate one or more pharmacological treatments for DM, report cognitive outcomes, present primary data, or if they were duplicate reports or reported findings of another study. Discrepancies were resolved by consensus. A kappa statistic was calculated to quantify agreement on the selection of papers for full-text review. This was done using inter-rater agreement and possibility of agreement due to chance, calculated in Stata V.14.2.426. Data from studies selected for full-text review were extracted in duplicate for quality assessment and analysis. Data collection included (if available) author; year of publication; country of origin; study design; population demographics (mean or median age, percentage female); method of diagnosis for DM, dementia, and/or MCI; intervention/exposure and control group; study duration; number of participants enrolled in study; number of participants completing study; duration of DM; glycated hemoglobin A1c (A1c) values; hypoglycemic episodes; and cognitive outcomes. Only studies using validated instruments to assess cognition (eg, Mini-Mental State Examination (MMSE), Alzheimer’s Disease Assessment Scale–Cognitive Subscale) were eligible for inclusion. The primary composite outcome of interest was the risk of incident dementia or progression of cognitive impairment associated with pharmacological treatment of DM. We additionally examined cognitive outcomes (either incident dementia, or progression of dementia or MCI) associated with the frequency of severe hypoglycemic episodes. We used risk ratios (RRs) as the common measure of association across studies. HRs were considered to be interchangeable with RRs as per methods described in previous meta-analysis by Chen et al.11 ORs were converted to RRs using the formula: RR=OR/[(1−P0)+(P0×OR)], where P0 is the incidence of the outcome of interest in the non-exposed (control) group. When there were insufficient data, study authors were contacted to request additional information if possible. A random-effects model was used to pool estimates across studies to account for both between-study and within-study variance. This was based on our assumption that there would be no one true estimate, but rather a distribution of estimates that would vary across studies. Where adequate data were available, we performed stratified analysis by mean age (<65 years vs ≥65 years), study size (≥10 000 participants versus <10 000), design (randomized controlled trials vs observational studies), study duration (≥3 years vs <3 years), and class of pharmacological agent(s). We divided sample sizes into <10 000 versus ≥10 000 individuals to ensure roughly equal numbers of studies were present in each stratified group. We categorized studies that investigated ≥1 antidiabetic medication compared with either no treatment or add-on to usual care as intensive treatment. We also evaluated the association between severe hypoglycemic episodes and the risk of adverse cognitive outcomes. We assessed for between-study heterogeneity using the I2 test statistic. Low, moderate, and high heterogeneity were defined as <25%, 25%–50%, and >50%, respectively.12 Stratified analyses were performed to explore for potential sources of heterogeneity when present. We used STATA V.14.2 (College Station, Texas, USA) to perform statistical analysis. 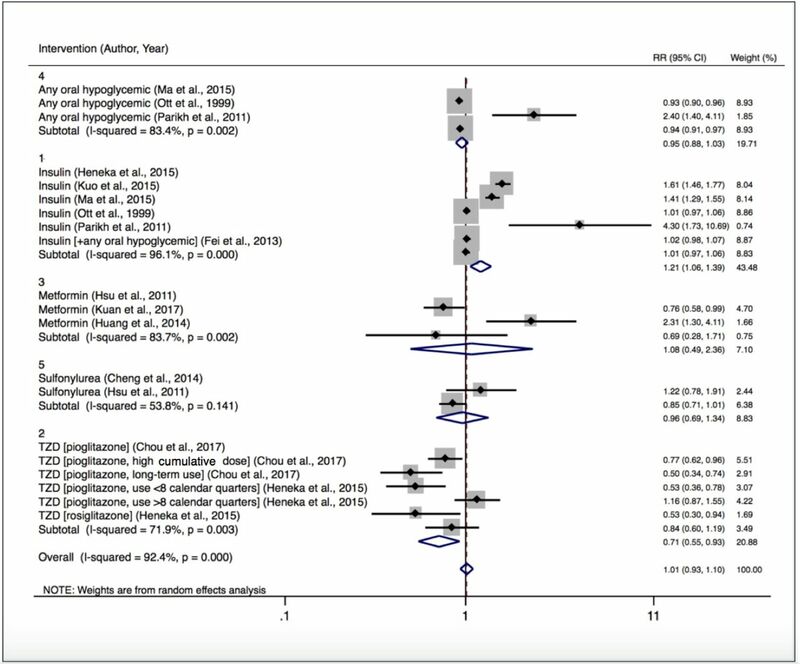 Conventional methods to assess for publication bias, such as funnel plots, are challenging to interpret for meta-analyses of observational studies where small study effects may be present. 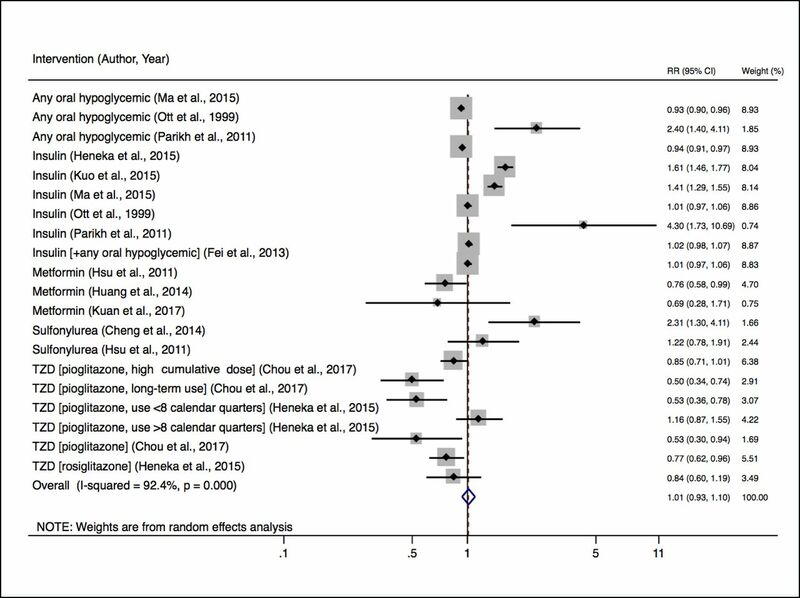 The presence of asymmetry may not necessarily represent publication bias, but rather clinical heterogeneity or bias inherent to the included studies (eg, residual confounding). As such, we did not assess for publication bias because the majority of included studies were observational in design. The electronic database search produced 5088 unique citations (online supplementary figure). After screening titles and abstracts, 370 articles were identified for full-text review. Of these, 37 studies were included in our systematic review and 13 of these were incorporated into our quantitative (meta) analysis. There was overall excellent agreement between the reviewers on articles selected for full-text review (κ=0.81; 95% CI 0.71 to 0.91). Of the 37 included studies, most were from Asia (n=14), Europe (n=10), and North America (n=10) and published between 1996 and 2017 (75% were published within the last 5 years; table 1). Study size ranged from 634 to 145 928 participants (72% were >1000 participants). Nearly one-third (27%) of studies did not report mean or median participant ages. When provided, 70% of studies reported a mean age >65. Duration of follow-up was reported in 81% of studies. This ranged from 6 months to 14.7 years (77% >3 years). Metformin and insulin were the two most common interventions. For most studies, the comparator was either placebo or standard care. Duration of DM, its severity and level of control, and frequency and severity of hypoglycemia were not consistently reported. All studies commented on the presence of dementia, but only a quarter (24%) provided data on MCI or dementia subtype (such as AD and VaD). Thirty-three studies were observational (ie, cohort, cross-section, case–control studies) and four were randomized controlled trials (RCTs) (online supplementary tables 1 and 2). Most observational studies (82%) enrolled exposed cases who were truly or somewhat representative of the population of interest. Nearly all studies (97%) enrolled non-exposed controls drawn from the same population as cases. When reported, the majority of studies (85%) had follow-up of ≥3 years. However, many studies did not provide information on the completeness of follow-up (eg, loss to follow-up was not reported in 64% of studies), how cognitive outcomes were assessed (39%), or whether the outcome of interest (eg, dementia) was present at enrolment (27%). 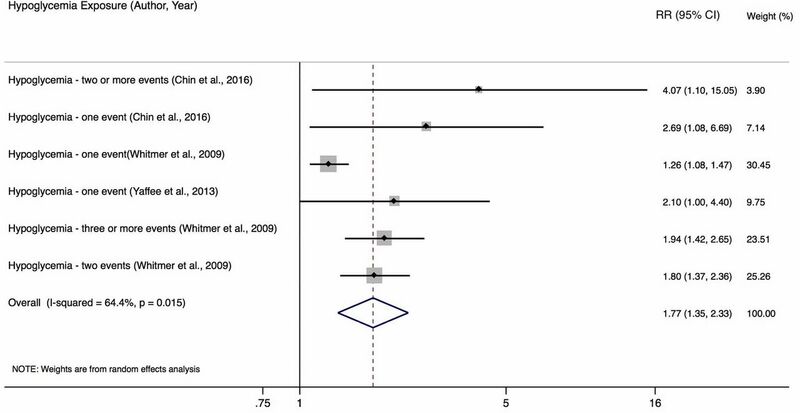 The study quality of the four RCTs was generally weak. Two did not provide sufficient detail to determine random sequence generation, allocation concealment, blinding of participants/personnel, or blinding of outcome assessment. Two were at risk of selective or incomplete outcome reporting. Two of the studies were potentially subject to industry bias. Thirteen studies were included in our meta-analysis. Ten investigated intensive therapy including any antidiabetic agent compared with no DM treatment, insulin added to prior therapy, metformin compared with no treatment, sulfonylurea compared with no treatment or as add-on therapy, and thiazolidinedione compared with no treatment or as add-on therapy. Intensive therapy (defined as add-on treatment) compared with prior care was not associated with incident dementia (RR 1.01; 95% CI 0.93 to 1.10). However, there was significant between-study heterogeneity (I2 92.4%, p=0.0001) (figure 1). Relative risk of developing dementia with intensive versus non-intensive antidiabetic treatment. RR, risk ratio; TZD, thiazolidinedione. Meta-regression was performed to explore heterogeneity, evaluating the effect of intervention type, age, sample size, proportion loss to follow-up, and duration of study on cognitive outcomes (online supplementary table 3). Only stratification by age (<65 and ≥65) had a notable effect on the RR estimates. Younger compared with older individuals were at greater risk for adverse cognitive outcomes during treatment (1.66, 95% CI 1.05 to 2.61 (n=2) for <65; and 1.00, 95% CI 0.94 to 1.07 (n=7) for ≥65; p=0.046). The meta-regression analyses may have been underpowered to detect significant differences for the other variables assessed due to a limited number of studies within categories. Relative risk of developing dementia by treatment type. RR, risk ratio; TZD, thiazolidinedione. Six studies were included in our meta-analysis.13–15 18 20 21 Treatment with insulin was associated with a 21% increased risk of incident dementia compared with other therapies or placebo (RR 1.21; 95% CI 1.06 to 1.39). In the eight studies that could not be included in our meta-analysis,16 17 19 22–26 there was a general pattern of adverse cognitive outcomes associated with insulin therapy, but there were important differences between the studies in patient characteristics, study duration, and whether (and how) DM duration and/or severity were adjusted for. Thirteen studies evaluated the association of metformin treatment on dementia in patients with DM20 24–35 with three included in our meta-analysis.24 30 31 A pooled estimate showed no significant difference in risk for developing dementia (RR 1.08; 95% CI 0.49 to 2.36). DM duration and severity could not be accounted for in the analysis. Seven studies investigated the association between one or more hypoglycemic episodes and cognitive function. Three of these reported on severe hypoglycemia (ie, requiring immediate medical assistance) and were included in the meta-analysis.39–41 The risk of developing dementia was nearly double with the occurrence of severe hypoglycemia (RR 1.77; 95% CI 1.35 to 2.33) (figure 3). There was an increased risk of harm seen across all studies. Four studies were not included in meta-analysis because RRs could not be calculated.42–45 In general, hypoglycemia was associated with cognitive decline. Relative risk of developing dementia based on to the occurrence of one or more hypoglycemic events. RR, risk ratio. The risk of cognitive impairment increases with the duration and severity of DM.17 48 These factors, which should be considered when assessing the association between DM treatment and cognitive outcomes, were not accounted for in many studies. Whether insulin directly increases the risk of incident dementia and other adverse cognitive outcomes remains uncertain. The apparent association may be driven, at least in part, by DM duration and severity, though severe hypoglycemia related to insulin treatment is another plausible mechanism. The association between metformin and dementia is complex. In one clinical trial, the use of metformin in newly treated patients with DM reduced the risk of MCI.49 Our systematic review found highly variable results across studies. The meta-analysis did not demonstrate any significant association between metformin use and adverse cognitive outcomes, though significant between-study heterogeneity was seen. Vitamin B12 deficiency, which is associated with metformin use,49 may be a potential factor that may adversely affect cognition. Other potential reasons for study heterogeneity may relate to unreported differences in DM severity, co-intervention, and comorbidity. Our findings should be interpreted in the context of the study design. The major limitation of our study was the inability to account for the duration or severity of diabetes because of inconsistent reporting in the primary studies. The majority of included studies were observational in nature. Inherent to all observational studies, residual confounding cannot be excluded. Among the four RCTs that were included, study quality was generally poor, which may have impacted our estimates. Furthermore, we quantified a large amount of heterogeneity, likely arising from true clinical differences between studies. Statistically combining heterogeneous data may be problematic. Although we were able to account for some of the observed heterogeneity in our stratified and meta-regression analyses, the results from these subgroups should be interpreted to be hypothesis-generating. Although heterogeneity was also seen in our estimates of harm associated with severe hypoglycemia, the direction of association was consistently reported in every study, thus strengthening the likelihood of a true association. The various antidiabetic therapies may have differential effects on cognitive outcomes, potentially mediated by risk of severe hypoglycemia. Future studies should consider DM duration and severity, and frequency and severity of hypoglycemia in assessing the complex association between DM and cognitive impairment. We wish to acknowledge Dr Diane Lorenzetti and Zahra Premji who assisted us in the development of the search strategy. Guarantor: JMM.
. Anti-hyperglycemic therapy and risk of dementia: a new user cohort study. Alzheimer's and dementia 2013;1:P136.
. The differential impact of diabetes medications on cognition. Alzheimer's and dementia 2013;1:P206.
. Risk for Alzheimer's disease in type 2 diabetic patients treated with metformin. Diabetes 2014;63:A372.
. Association of metformin therapy with the risk of dementia in older adults with type 2 diabetes mellitus. European Geriatric Medicine 2016;7:S62–S3.
. The effect of dipeptidyl peptidase-4 inhibitors versus sulfonylureas on mental status, cognition, and physical functioning in older nursing home residents. J Am Geriatr Soc 2017;65:S220–S1.
. Severe hypoglycemia and risk of dementia in person with diabetes mellitus. Journal of Diabetes Investigation 2017;8:35.
. Neurologic manifestations of hypoglycemia. Diabetes—Damages and Treatments: InTech, 2011.
. Study of Nasal Insulin to Fight Forgetfulness (SNIFF). United States: US: Department of Health and Human Services, 2013. Contributors JMM: literature search, study design, data collection, data analysis and interpretation, and writing. BSM: literature search, study design, data collection, data analysis and interpretation, and writing. DBH: study design, data analysis and interpretation, and writing. AAL: study design, data analysis and interpretation, and writing. Funding The Brenda Strafford Foundation Chair in Geriatric Medicine has provided funding for Open Access Publication. JMM has received an academic scholarship for tuition for Graduate Studies. BSM has received an academic scholarship from the Government of Alberta. AAL is a recipient of the Hypertension Canada New Investigator Award. Disclaimer The funding sources had no role in the study design or decision to submit the manuscript for publication.